iPad 3G & Worldwide Release Date April 24th? Rumors are hitting the web as we speak that a spokesperson from Apple has confirmed April 24th as the global release date for the iPad. So what happened last Saturday, April 3rd, was just the United States release, and now the rest of the world can start buying the iPad on April 24th. Is April 24th also the release date for the iPad 3G? 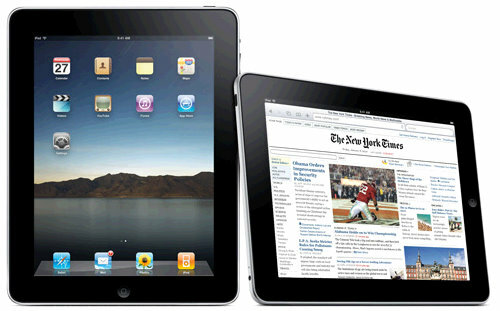 We still do not have a solid release date for the much anticipated iPad 3G. In many regards, I think we can expect the 3G release to be a bigger hit than the first generation iPad that was released last Saturday. And on the iPad’s debut here in the US, Apple ended up selling 300,000 iPads! So if April 24th is the release date for the iPad to go worldwide, can we also expect it to be the day that we see the iPad 3G made available? Honestly I hoPe so! DO you have any idea how hard it is seeing people out there with their wifi versions already? APPle should have made both models available on day 1! I agree whole heartedly!! This is pure torture!! I'm glad I'm not the only one. Although, to be fair, this is probably an AT&T issue–par usual. All-in-all, I'm happy with AT&T service as I don't live in New York or LA, but the delay in MMS, the fact that I still can't tether my iPhone with my MacBook and now . . . this gut wrenching wait for my 3G iPad . . . when will the madness end? Sp. ?? Usage ?? – "Yep [Oy!] you heard it hear [Oy Oy Oy, it's 'here' not hear] first. No sir, you will get it on the 30th if you ordered early enough, not the 28th. Just wishful thinking or a psychotic episode. So here I bought the Wi-Fi last night thinking Philadelphia is all Wi-Fi. I am in center city and can't get a connection. I am selling it and am purchasing a 3g. I can't wait till my fingertips meet my new ipad 3g! Yes I am desperate. Hope the rumors of April 24th turns into a reality. Never I did I think I will feel this way over anything in my life. I am going bonkers too. Finally broke down and went in the Apple store to get a wifi today. I figured I would play around with it and then return it when the 3g came out. No such luck, they're sold out of the wifi models. Uggggghhhh, I'm literally going nuts. This is a complete joke, they should of held the wifi version until all versions were ready to ship. Us customers who are paying MORE $$$ are getting the shaft! Okay this comment is so stupid I can't resist commenting. US customers are paying more for what? Getting the shaft? Are you sure its an iPad you were looking for? Maybe it was an iDildo? what kind of losers buy something try it and return it? Who is supposed to pay for that? You are crooked. Yeah cry me a river. They're they ones being obnoxious with the failure to tell us when the stupid thing will be released. I'm to the point where I'm getting ticked off now. Two can play the coy game…they resell them anyway. That's just stupid. Earlier pre-orders will be delivered April 30th. Just cancelled my order from Apple because of the push back. I do not like being lied too. That was pretty stupid since Apple didn't push back the delivery date. YOU ARE A FOOL! now this is what i would do. go to the store, fight off all the bored grannys and buy it and then when it turns up on the 7th DONt sign for it and it will be returned to apple for a refund. When you placed your order the item was not available so it was a pre-order. When you ordered you were told it would ship by May 7th right? SO WHAT IS YOUR PROBLEM? James, did you even read the posts before you went off? Anyone who pre-ordered BEFORE April 19th will get it on April 30th, not May 7th. By April 19th they had run out of uncommitted units that would be ready by April 30th, so anyone who ordered after that (including further orders from the stores themselves) won't get them until May 7th. I just received a text from the Apple store saying that my I-Pad case has shipped — should be here by Monday. Could it be that the 3G is not far behind??? I order the 3G before the 19th so I expect it to arrive before or on the same day as the store versions. I did actually get an email stating that mine would be shipped by the end of April about half a day after they announced the 19th being the pre-order cut-off date. I also ordered the case and camera adapter. The case arrived two weeks ago, the camera adapter just shipped the other day and should be here Monday so the iPad itself needs to ship tonight or Monday to be here by the 30th (end of month, which is a far cry from "Late April" but I digress…) All the items came from some place in China (or some such country, it wasn't the US). It's aggravating that it's taking this long. I agree with the others though, they should have released both at the same time. I've yet to touch an actual iPad though I've stared at them across the room in store fronts. I'm trying to be good and wait for mine but …. While April 30th is as late in April as you can get, it is still late April. GET OVER IT ALREADY! Why should you be aggravated? I am as anxious as anyone else to get mine, but aggravated? It's being delivered late April as promised. Why should WIFI only customers have to wait if their product was ready to ship? Take you marble sack and go home you whinny baby. So what you are saying is Apple should have delayed all sales until the 30th of April? Are you insane? It's sort of like saying a car dealership shouldn't sale any 2010 Ford Mustangs until every car her ordered is on the lot. That is just plain stupid. They haven't taken your money yet buddy. Get a grip. I just checked my order and it says "prepared for shipment" so I am guessing it will be here by the 30th. WOO-HOO! !